I think the 35 thumbnails did the trick to jump-start my work for the new year. 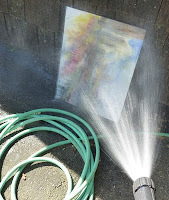 This is the oil-wash foundation for my first painting of the Hometown Marshland series. It is based upon the very first thumbnail in a previous post. 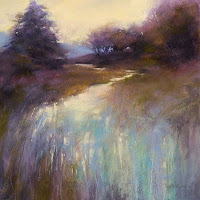 I like this very much because of the spontaneity and am SO tempted to leave it as it is and call it an oil painting. But, the point of my bright idea was to take a reference photo, paint a watercolor thumbnail using the photo as a guide, and move on through the process to complete a pastel painting. My goal for the finished painting will be to keep the looseness but to add enough detail to draw the viewer into the story behind the scene. My hometown is Auburn, Washington. I spent my first 21 years there with my family, in a little house built by my father near the railroad tracks. When I was shooting the photos for this series, I could hear train whistles in the distance...music to my ears and soul. 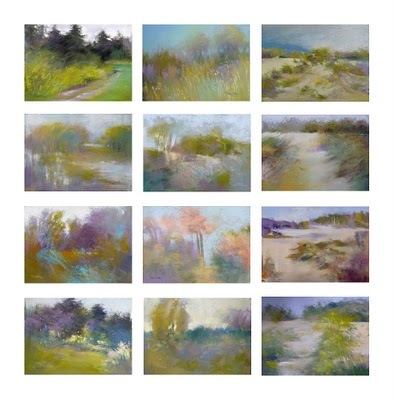 Here is the result of my bright idea of painting 35 small watercolor thumbnails while viewing reference photos on my computer display. 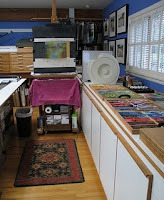 The paper is a 14 x 20 inch pad of Lanaquarelle, 140 lb. cold press. To begin, I used a fat black Sharpie pen to layout squares - the format I prefer for my finished paintings. Click on the image to enlarge. 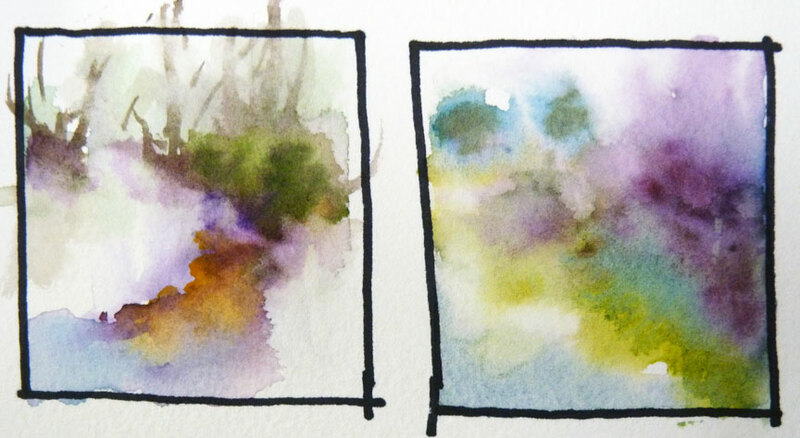 I started at the top left corner and closely followed what I saw in the reference photo. My left-brain said "You should write the photo number beneath the thumbnail so you can find the photo again." So, I did that for about 5 thumbnails. Then I got involved in the process of painting and decided that identifying the specific reference photo wasn't important to me. 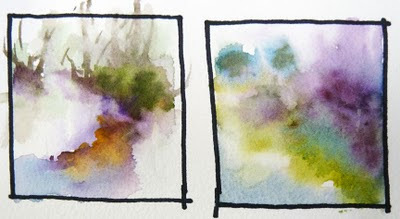 I found myself caught up in playing with the color and experimenting with the lovely things that watercolor does - such an alive medium! 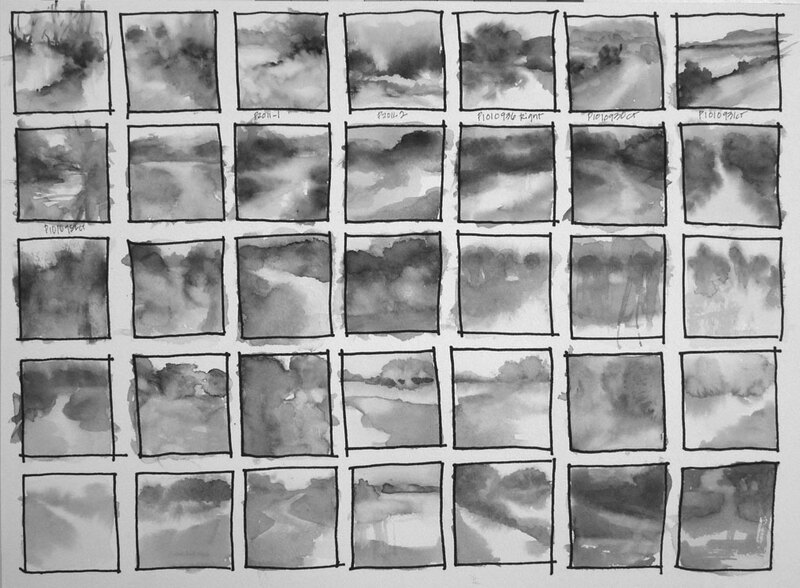 By the time I got to the bottom row, my thumbnails had evolved into value and composition studies with much less detail than the thumbnails painted at the beginning of this experiment. For additional information, I used Photoshop to turn the thumbnail images into black and white. See the image below. 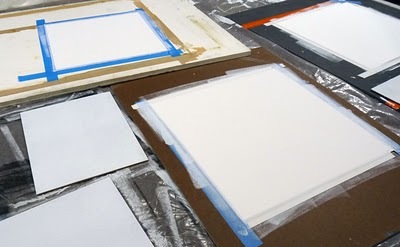 I plan to paint finished pastel paintings using the sheet of original thumbnails and a print-out of the gray scale images as my references. 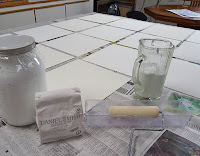 This was a fun, totally absorbing exercise. I'm trying to jump-start my painting year. Went on a photo shoot (see two photos on my display above), then started with black and white thumbnails but my thumbnails always end up with too much line work and too much detail. 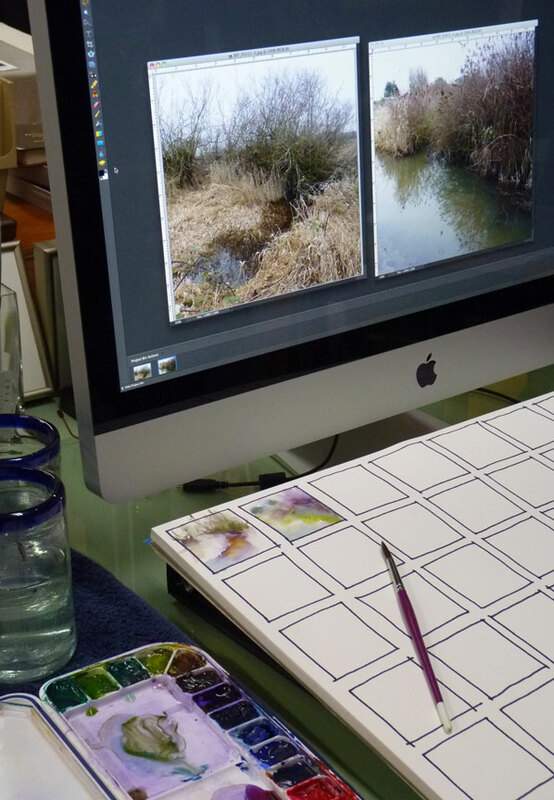 My bright idea is to bring the reference photos up on my display and do tiny loose watercolor thumbnails concentrating on value, color and form. The first two were fun. I'll let you know how this goes. Today we drove to my hometown for a photo shoot. 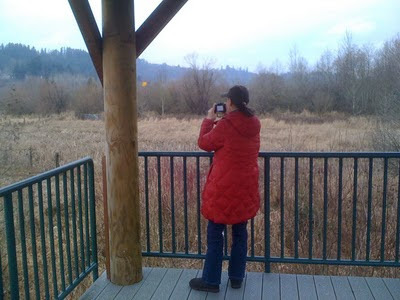 I didn't realize there were so many marshy areas...we even found this elevated perch built specifically to view the wetlands. 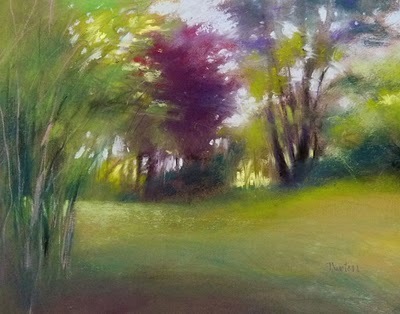 Grasses and trees are moist and muted with colors blending one into the next...a beautifully subdued time of year. Today's scenes should lure me away from tax preparation and get me painting again. 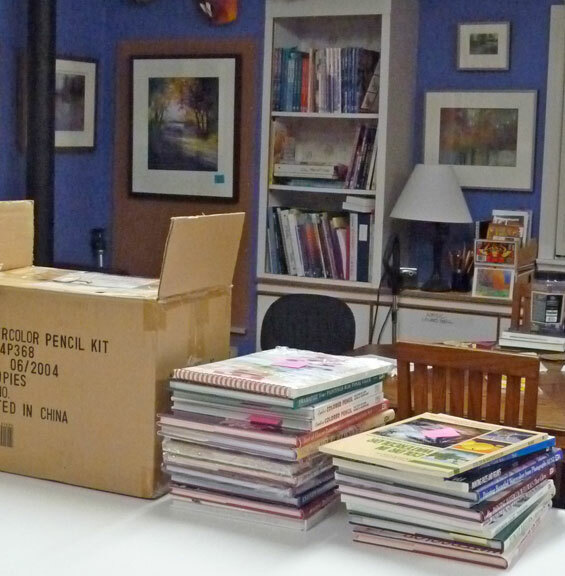 I'm cleaning out bookshelves and have 36 art books from my private collection that need new homes. A variety of mediums, all in very good condition. I set up a little store on Amazon under my business name, Bina Designs (since 1988). To see my books for sale, CLICK HERE. 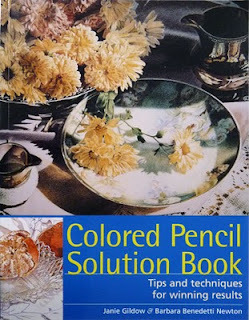 Some of you may know of my past with colored pencil and the book I co-authored, "Colored Pencil Solution Book." Since I posted last - 10 days ago - I've been cleaning the studio and I found a box of 9 new books (8 soft cover, 1 hard cover). If anyone is interested in purchasing one of these, please email me at barbaranewton@comcast.net. I'll be happy to sign it! 2011 is here and I'm excited to begin painting again after the holiday break, but I was curious what 2010 looks like in review. 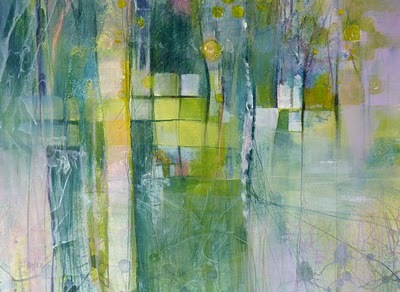 2010 painting began with experimentation in mixed media and non-objective work. It wasn't long before I found some old pastel paintings to hose off so I could use the paper for new paintings. 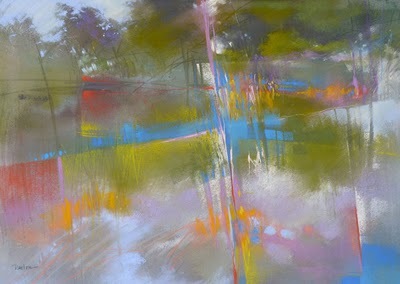 "Tuesday's Child" was the result of a pastel rework. 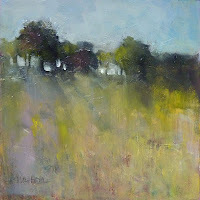 Then, I found some old oil experiments to repaint. 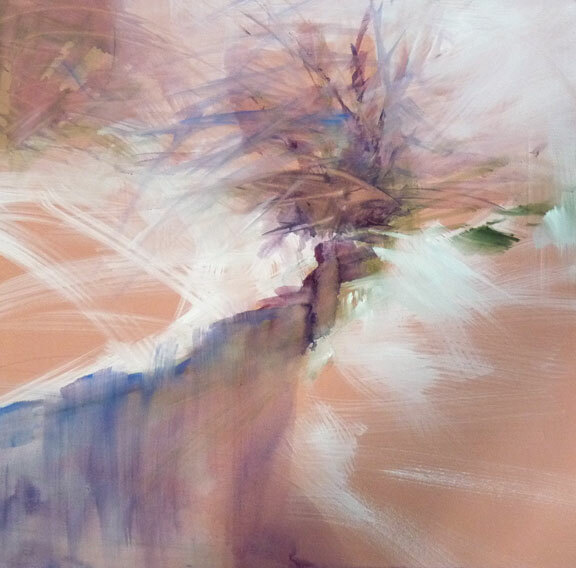 Suddenly, it was summer and I was back to pastel. 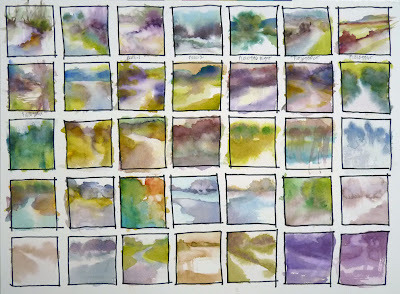 A trip to Carmel, California and a series of 5 x 7 abstracted landscapes followed. 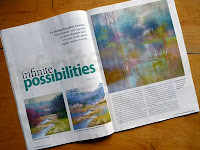 I was honored to have an article, "Infinite Possibilities," about reworking pastel paintings, published in the October 2010 issue of The Pastel Journal. In the fall of 2010, I began experimenting with mixing my own pastel grounds. 2010 ended with a series of seven pastel paintings on my hand-made surfaces. 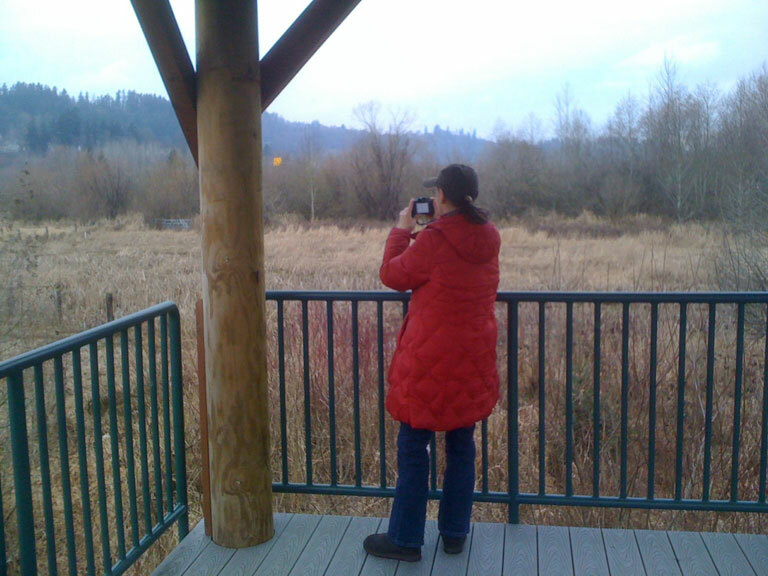 Looking back, 2010 was a year of experimentation. While The Pastel Journal article was certainly a highlight - as were awards received, the primary achievement of the year was learning more about myself through my work and through contact with other artists and those who appreciate art. 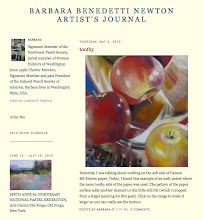 Thank you for visiting my journal and for your comments and support. Wishing you a happy new year!